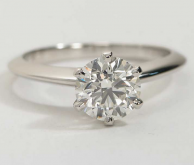 Two trillion cut diamonds sit on either side of your center diamond, adding a unique style that you won’t find on most engagement rings — the trillion cut is a fairly rare diamond shape. 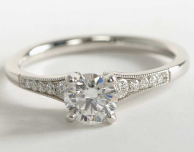 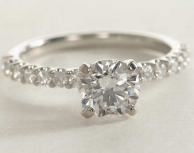 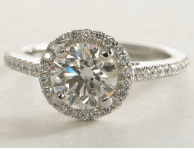 The platinum band is also on the thinner side, so your diamonds will appear slightly larger. 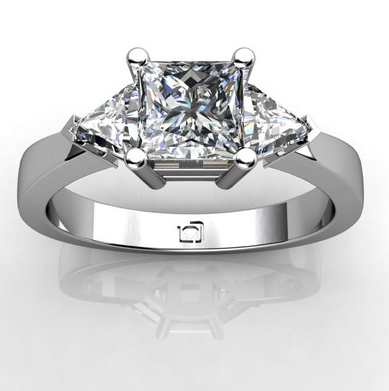 This setting is meant for square shaped diamonds: princess and Asscher cut diamonds in particular, and some cushion, radiant, and emerald cut diamonds might also work well with this ring.